Happy Tax Day everyone! I know, I know, it’s not a holiday and probably not a day that you are very happy about, that is unless you are getting a big fat refund check. However, we can be happy that tax season is over and we don’t have to stress about it for another year. 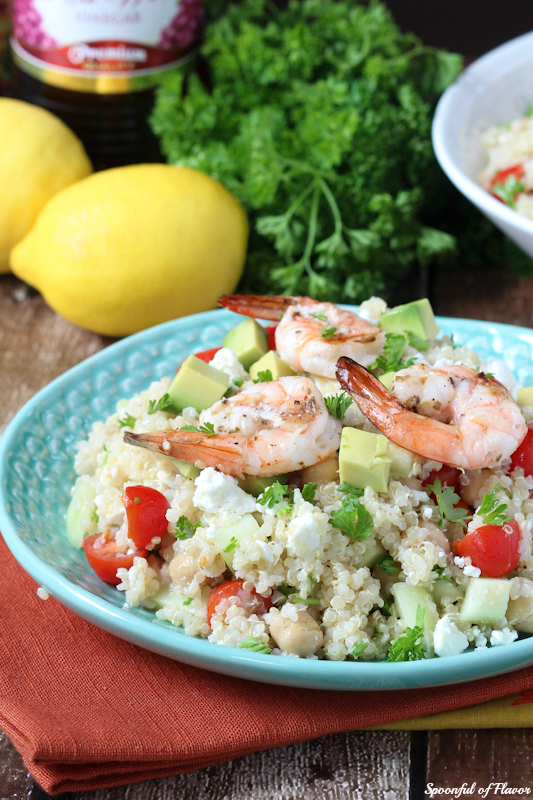 To ease your stress for the day I’m sharing a tasty recipe for Cilantro Lime Shrimp Quinoa Bowls! In case you are new to reading Ashley’s blog, my name is Danae and I blog over at Recipe Runner. Today I’m sharing my monthly guest post here on the new and gorgeously improved Spoonful of Flavor! Aren’t you guys just loving Ashley’s new blog design?! It seems only fitting that I share pretty food on such a pretty blog! Let’s get down to business and talk about these bowls. 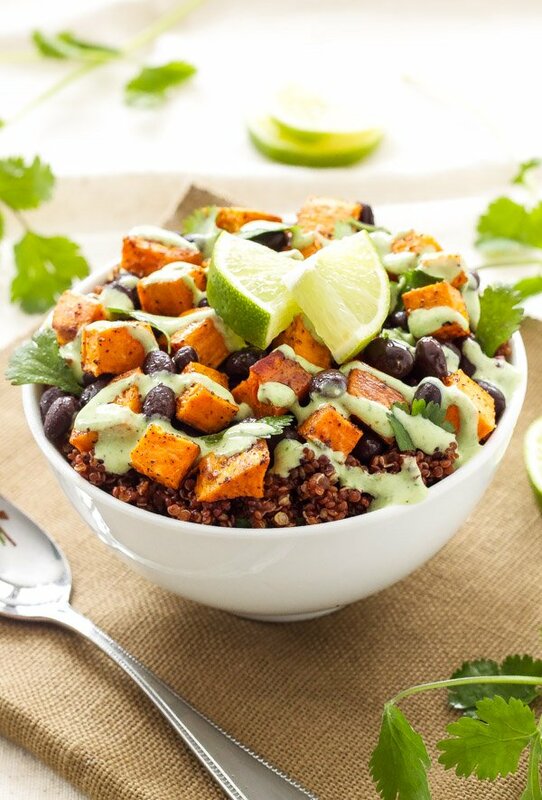 If you follow along on Ashley’s blog you may remember a while back when I shared the recipe for Sweet Potato and Black Bean Quinoa Bowls. Everyone seemed to really like those bowls so I thought it was time to come up with another tasty quinoa bowl! Bowls seems to be really hot right now. How could they not be? Who doesn’t love a big bowl filled with your favorite carbs, proteins, and veggies? Top it off with a delicious sauce or drizzle and you have a the perfect healthy and easy to make lunch or dinner. When it comes to making bowls, the sky is the limit. Southwest, Italian, Greek, Asian, any of them will do! Today we are going a little Southwest with a hint of tropical because the weather is warming up and if you are like me you are craving lighter and fresher food. The main carb in these bowls is the quinoa. 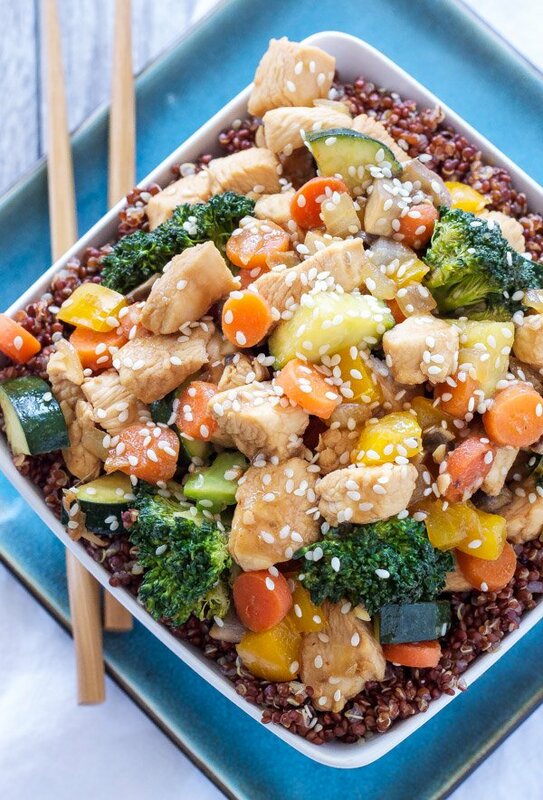 I used tri-color or rainbow quinoa because I love the colors, but any quinoa you have will work. The quinoa has lime juice and cilantro added in for extra flavor, because extra flavor means extra good! There are two proteins, shrimp and black beans, so they will keep you full for hours. The shrimp is also full of the cilantro lime flavor because honestly it’s probably one of my favorite flavor combos. Cilantro haters, I’m sorry, but you probably aren’t going to like this dish one bit, come back next month and I’ll make you something cilantroless! 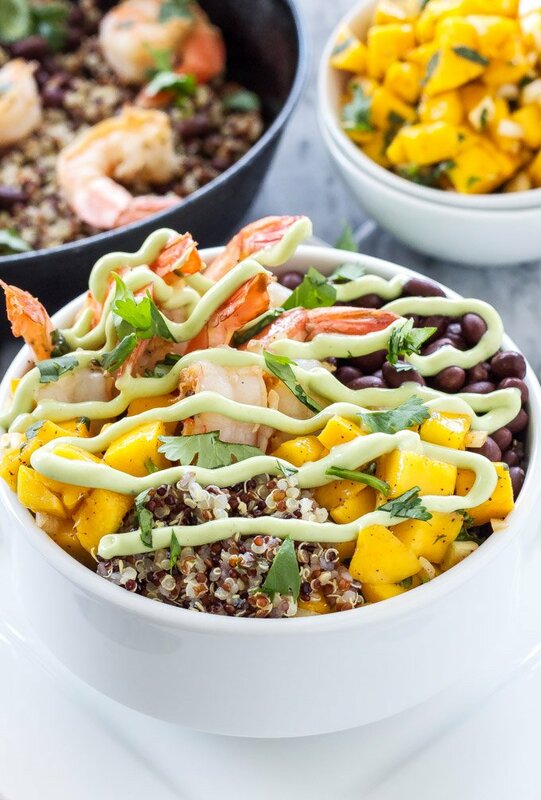 The final toppings for these quinoa bowls that makes them out of this world delicious are the mango salsa and the avocado crema. I’m pretty sure I ate half the salsa before it made it into the bowl and that avocado crema…well let’s just say it should be slathered on everything! 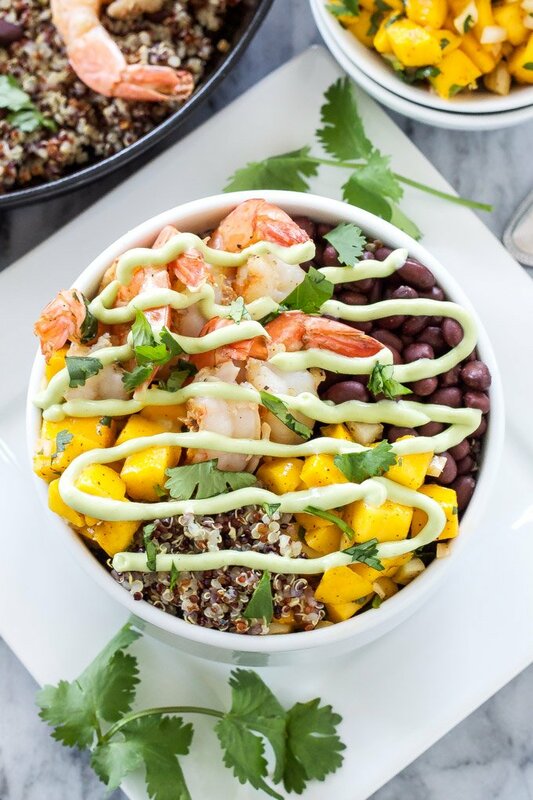 Let’s all celebrate that tax season is gone for another year and de-stress ourselves with these Cilantro Lime Shrimp Quinoa Bowls! 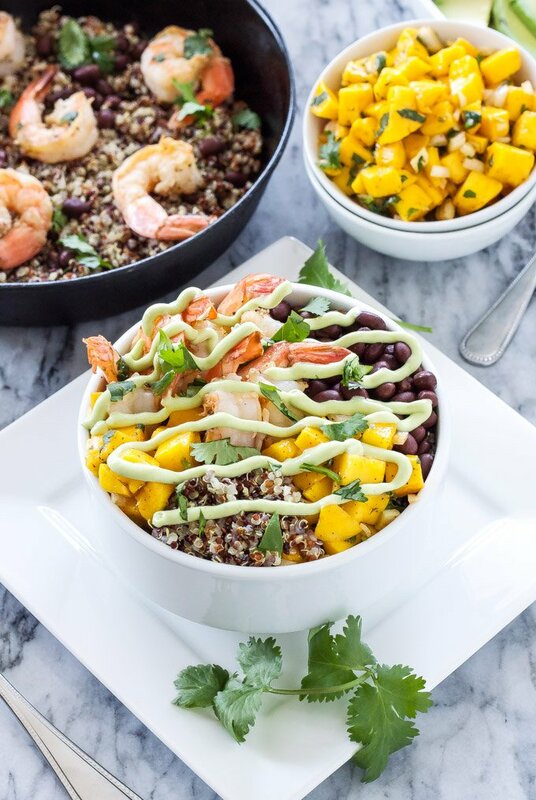 Cilantro Lime Shrimp Quinoa Bowls. 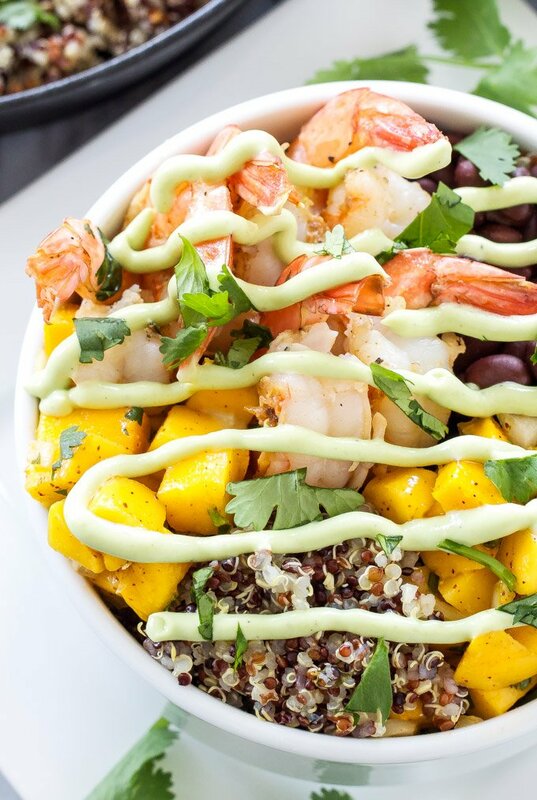 A delicious and gluten free quinoa bowl full of Southwest and tropical flavors! In a medium sized sauce pan bring the quinoa, 1/2 teaspoon of salt, and 2 cups of water to a boil. Once the quinoa is boiling reduce the heat to medium low, cover with a lid, and let it simmer for 15-20 minutes or until all the liquid is absorbed. Off the heat stir in the lime juice and cilantro. In a large bowl toss together the diced mangos, red onion, cilantro, chili powder, and salt. In a blender combine all of the ingredients and blend until smooth. Scoop the crema out into a bowl or put it in a squeeze bottle, cover, and refrigerate until ready to serve. Season the shrimp with salt, pepper, and the cumin. Heat the oil in a large nonstick or cast iron skillet over medium high heat. When the skillet is hot add in the shrimp. Cook the shrimp for about 2 minutes then flip them over and cook the other side for another 1-2 minutes. At the very end of the cooking squeeze in the juice of half a lime and add in the chopped cilantro. Fill each bowl with about 1/2 a cup of the cooked quinoa. Top the quinoa with a 1/4 of the shrimp, 1/4 of the black beans, and as much mango salsa and avocado cream as desired. Wow! That bowl looks amazing, those flavors would just make my mouth so happy! This looks delicious, but the recipe isn't posted anywhere! (All other sites link back to this one, and this one doesn't have it.) Can you please repost?! Thanks! Hi, Sarah! The recipe was unavailable temporarily but is available now. Sorry for the inconvenience! That is one bowl of YUM! Going on my dinner list! Gorgeous photos! Thanks so much for linking up at #Purebloglove link party! The party begins every Thursday at 8 p.m. and runs through the week end. I'm hosting over at www.homemadefoodjunkie.com. We love to see you there! This looks delicious, Ashley! I love anything Mexican. Thanks for sharing it with us at #FoodieFriDIY! Sending some foodie love your way!